Let’s make some noise on Purim! 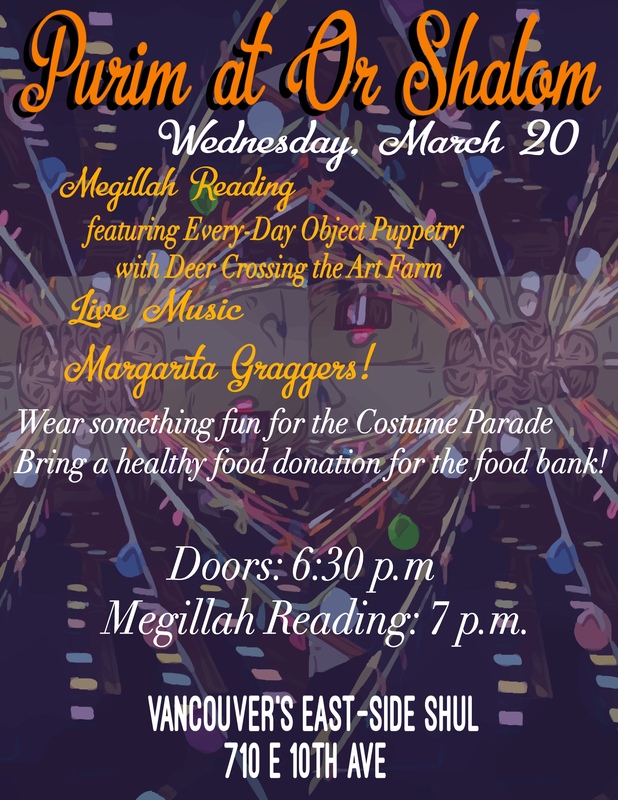 Or Shalom’s Purim gathering on March 20 will feature a creative reading of the Megillah, the Book of Esther. Rabbi Hannah has been assembling some talented folks from the community for a creative reading of the Megillah so that all who attend can hear the story of Esther. Part of the story will be told through the eyes of puppets, that is, if they have eyes! These puppets will be created from every-day objects: they could be spatulas, boots, plungers, pencils. Several Or Shalomniks have been working under the guidance of the artists behind Deer Crossing the Art Farm – Chad Hershler and Sandy Buck to perform two chapters of the Megillah. Come find out what they bring to life on March 20! Read Rabbi Hannah’s D’var Torah for the week of Purim. We’ll have a great band comprised of Michael Corber on accordion, Michael Klein and Dave Kauffman on clarinet, Noah Gotfrit on string bass, and Martin Gotfrit on guitar and mandolin who will provide the tunes for dancing and singing. Harriet Frost and Rabbi Hannah will lead the singing. As is tradition, wear a fun costume so you can participate in the costume parade. You’ll need a noisemaker too to join in on blotting out Haman’s name. If you don’t have one, we’ll have lots to choose from. We’ll also be serving margaritas (alcoholic and non-alcoholic) and tasty hamantaschen. Be sure to bring a non-perishable donation for the Jewish Food Bank. 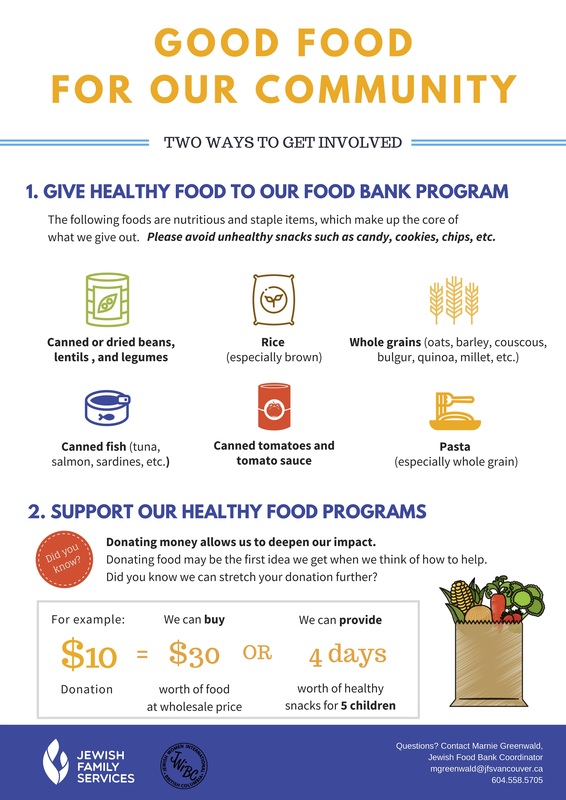 Administered by Jewish Family Services, everyone is encouraged to practice mindful donating, that is, donate healthy food options. Some of the items JFS says they need include canned or dried beans, lentils, and legumes; whole grains and brown rice; and canned fish. Check out the poster below for more suggested guidelines. Never been to Or Shalom? Purim is a great day to make it your first time! Greeters at the door will be delighted to welcome you to Vancouver’ East-Side Shul. This entry was posted in Upcoming Events and tagged Purim. Bookmark the permalink.